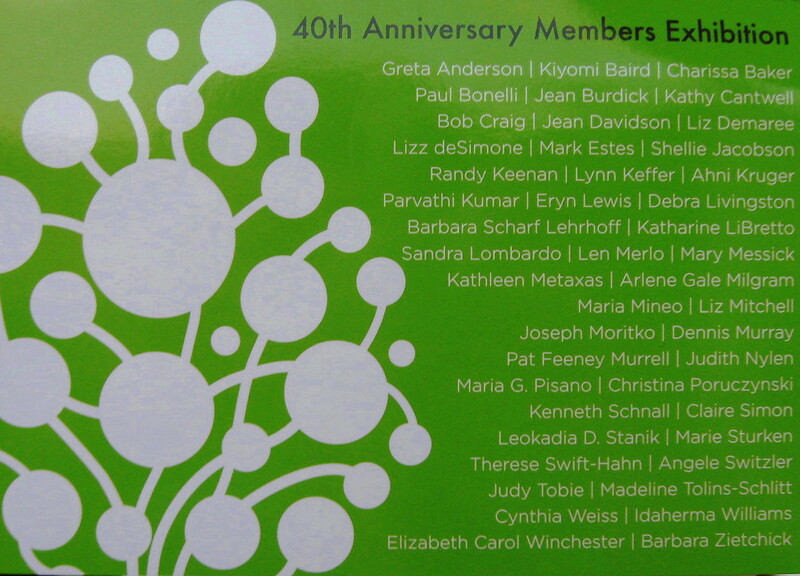 Today's mail brought a short stack of postcards for the upcoming 40th Anniversary Member's exhibition at PCNJ. I know most of the 44 other names on the list of participating artists, including three people who took woodcut classes I offered there over the years. The show opens a week from tomorrow, Saturday, June 8th, with our annual meeting, a potluck lunch, and reception from noon to 4:00 pm. 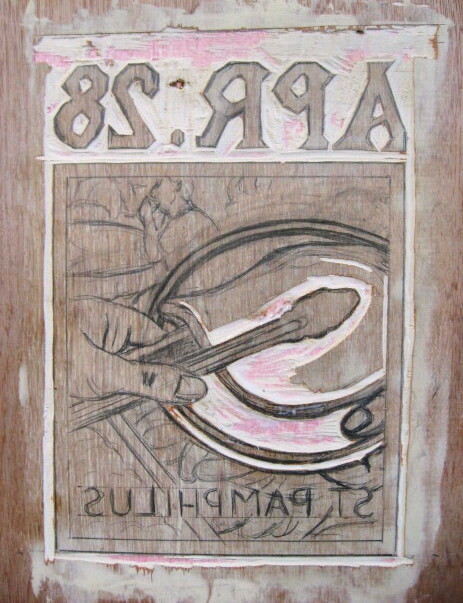 It will remain on display during regular gallery hours through August 10, 2013. The notification I received about the upcoming show at PCNJ asked us to deliver the work between June 1st and 4th, or between tomorrow and Tuesday. Normally the place is closed Sunday and Monday, so I was curious if we had more options than usual. I called up there this morning to ask, and learned that there will be a class going on during the day on Monday, so that will be an option for drop off. Tomorrow is expected to be a very warm sunny Saturday, so I think I'm better off not giving myself another weekend trip up and down the Parkway. Got lucky last week, but don't know if I would get another easy ride tomorrow. So I'll wait until next week, which gives me a few more days to get my stuff ready for delivery. Up to the Studio for a little while today to continue work on latest copy of the house print. Today I added skin tones, all the dark brown wood, and some of the light brown wood. Getting closer, and I should be able to finish the last few colors over the weekend, before I deliver the one I'm copying colors from to the show. The time to deliver my pieces to the upcoming PCNJ show is coming soon, so I need to get some work done. Got up to the Studio for a few hours in the afternoon. 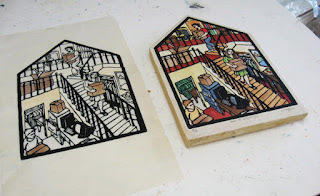 My existing mounted copy of the house print still looked properly glued down, but the coloring needed some touch up. And while I had my watercolors out, I started coloring the latest proof of this image to match the one I have. I only got as far as the light colored walls and the brown cardboard boxes today, but I think I can get it all done tomorrow. 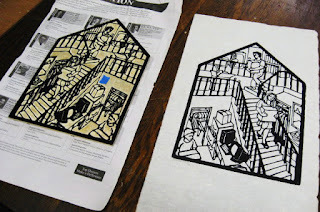 I had scheduled a new round of woodcut classes at the Belmar Arts Council to begin shortly after the end of my college classes. Problem was that as of the first night, despite several people contacting me and expressing interest, I only had one student, not enough to be worth running. But then a week later one of those expressing interest earlier asked if he could join the class. I put it back on the schedule and we advertised it again. Soon I was officially up to two, a number I've worked with before, and had another inquiry, but with the office closed since Saturday, I didn't know for sure what I'd be getting. But I knew it would be running. A couple of complications this morning. A rainstorm was coming in ahead of schedule, meaning my moving supplies and print examples around was about to get a little more difficult. Even bigger, the President was coming to the area today to tour progress on rebuilding the shore, ending with a speech in Asbury. Word was out that the planned itinerary could result in shutting down many of the area main roads for hours, including everything around the Studio. Since I had a lot of materials for my workshop stored there, I had to get up fairly early to make sure I could get there, and just as important, get out again. Well, I did all that and went home to take care of a few things. Had not heard one way or the other through the afternoon about my final class list, but I knew I was going anyway. I got to the Boatworks plenty early and started unloading the car, which took several trips and got me wet as the rain had chosen that moment to start up again. My students started to arrive, and it turned out I had four people for the class. 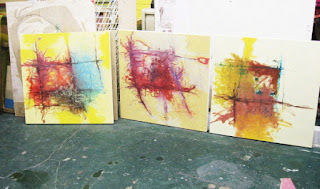 Three were brand new, so much of the first class was me doing the usual first week routine- showing them some prints from the collection before getting them started on some blocks of their own. (Mary, back taking the class for the 5th time, kept herself busy at a separate table with a new project of her own) Also as usual, I was too busy displaying prints and demonstrating stuff to have time to take any photos of the students in progress, so above is a photo of some of the mess that was left behind at the end of class. We had three tables going, so it was quite a lot to clean up at the end of the night. About five weeks ago I delivered four framed prints to the Arts Guild NJ for a curated show, which has been up ever since. At the time we were told that the exhibition would run through May 30th, but the week before last we received an e-mail telling us that we would need to come pick up our art on Saturday May 25th at 10:30 pm. Eventually we were told it was meant to be 10:30 am, which made a little more sense, but I still wasn't crazy about the date. After all, everyone in the show is from the Asbury area, and we were being asked to drive up on the Saturday morning of Memorial Day Weekend and then come back down the Parkway on one of the busiest travel days of the year. 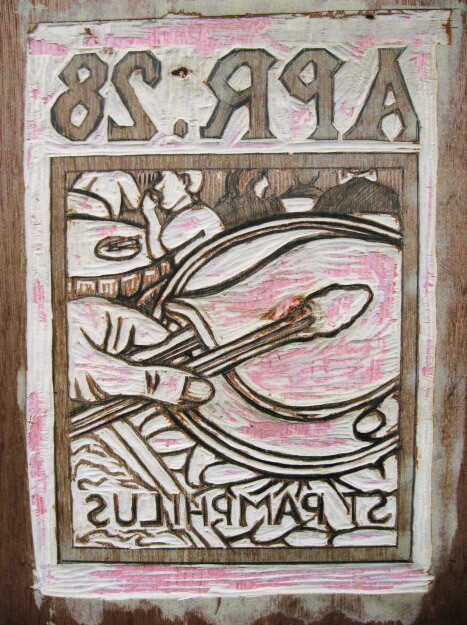 I was told I could wait until Tuesday, but this past week my woodcut class in Belmar was reinstated, first meeting to be Tuesday night. Could make for a tight schedule that day. Well, we caught a bit of break. Been a bit rainy this week, including a bunch of passing showers the last couple of days. No floods or anything, but enough to discourage some people from being in a hurry to get the the shore. Early this morning I checked the traffic and weather station on tv and found that things were pretty quiet. I stopped by the Studio to pick up Molly and we hit the road. Barely any rain on the way up, and we could see almost no traffic coming south. 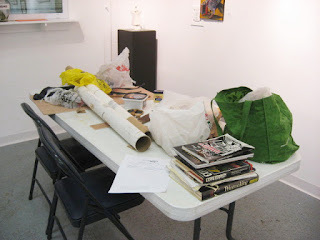 We got up to Rahway, quickly packed up our respective artworks, and got on our way by around 11:00. The weather continued to clear and a few more cars joined us for the return trip, but nothing like a holiday weekend, much less any summer weekend- more like typical off peak weekday traffic. Back to the Studio where Molly dropped stuff off and picked up her car, then I drove home, happy to have gotten through this task without any difficulties. In about a week or so I need to deliver some work to a show at the Printmaking Center of NJ, and one of those prints is the house shaped print I made last year. The original was done for a fund raiser show in Belmar, and was kept for a charity auction that has yet to happen. Luckily, before I donated that piece, I made an identical copy, once again mounting it on a piece of wood with the same shape. That second copy has been on display in my apartment ever since. However, I recently noticed that a little piece of the print had bubbled up from the backing. When the piece was accepted into the show, I knew that I had to deal with this somehow. I was able to carefully separate the print from the wood along the edge nearest the bubble, and then I re-glued it flat back to the edge. It has stayed flat, but the glue did cause a little discoloration of the thin Japanese paper it's printed on. I plan to attempt to repair, or at least disguise these spots, but just in case I can't do that, I decided to make another copy of the print. Actually this would be a good idea anyway for the same reason mentioned in the first paragraph, in case the copy going to his show doesn't come back to me, I'll still have a properly colored copy. So today I went to the Studio long enough to pull a proof on the same okawara paper. This particular block rolls up very quickly, and printing on thin Japanese paper is very easy, so it took longer to clean up than it did to ink and print the block. Early next week I'll do the coloring. Back in the Studio today for a few hours to work on different projects, but the main thing accomplished was advancing the latest saint print through the coloring process. 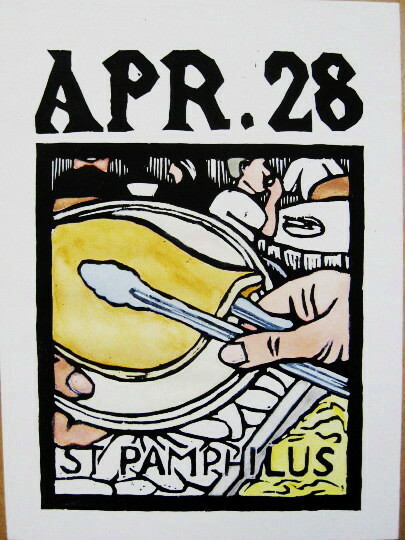 I darkened the pancake color- the same color paint, just more of it. Haven't found my regular fine line brush yet, but found one that at least allowed me to fill in the dark blue for the stripe around the edge of the plate. The most notable difference is I put in the color for the steam tray of sausages, which sets up a strong value contrast with the plate, hands, and eggs. I added a little bit of color here and there in the background. The more I look at this, the more sure I am that I will have to go back and cut a little more out of this block. 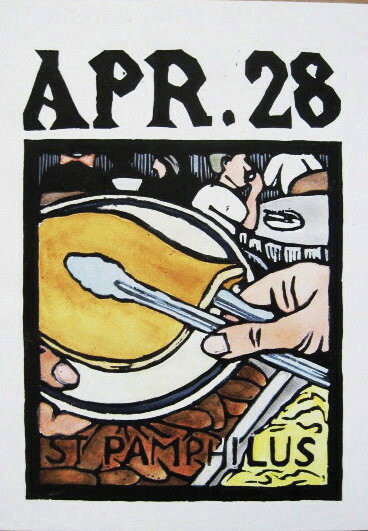 The solid black in the background characters in the upper left is too strong to balance with the kind of colors I imagine using in that part of the composition, and the black line that marks the top (far) edge of the pancake is way too heavy. 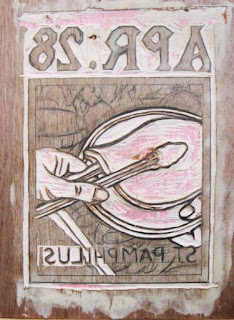 I think that all the colors in the hands, plate, and food are working well, so once I've recut and printed the background area, I just need to choose colors that will work with what I have here. With all my school grades done, and before I have to start dealing with students complaining about those grades, I went into the Studio today to pick up where I left off on the current project. 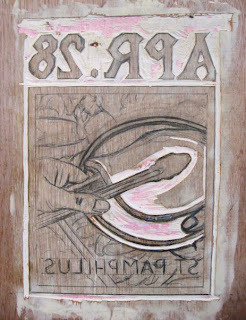 I stretched the proof I had pulled a couple of weeks ago on a drawing board and began the process of coloring it. Started with the pancake first, since everyone at the critique was so concerned about how I'd deal with it. After that a few skin tones, some metallic pieces (tongs and trays), and the yellow scrambled eggs. Put down a light off white on the plate, but the stripe will have to wait until I can find my fine point brush. I need to think about the rest, so I brought it home to look at. Today was the opening reception for the latest Art on the Edge exhibition at the Boatworks in Belmar. 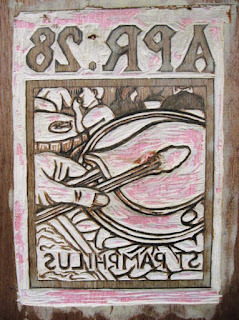 Not yet seen on this blog had been the above print, one of two things I have in this show. Never had a digital photo of this one before, as digital cameras were not nearly so common back in the 90's when I first made this print, and I haven't had occasion to show it recently. Luckily it survived the flood. Big crowd for the opening this afternoon, photos of which can be seen here. 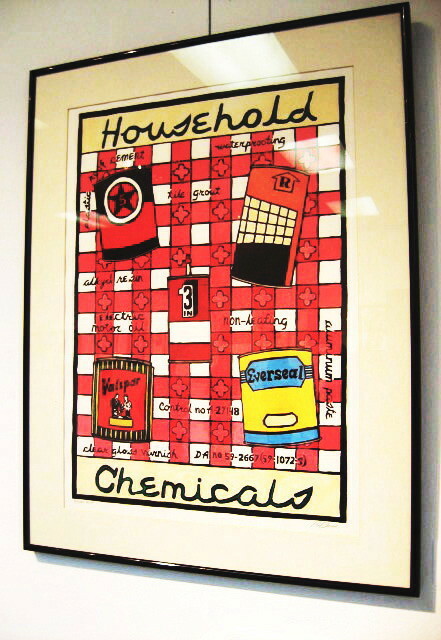 The show remains on display through June 14, 2013. Time to catch up on some art news. I went down to my parents' house today to help with some yard work (about time to get the vegetable garden ready) and my mother told me that I was mentioned in an art review in the Asbury Park Press. At first I was thinking it was a write up about the Art on the Edge show that's up on the walls at the Boatworks and opens tomorrow night. However, it turned out it was a review of the current Preemptive Strike show up in Rahway. Not a location that normally gets reviewed in a Monmouth newspaper, but the whole show has its roots down here, so it makes sense. 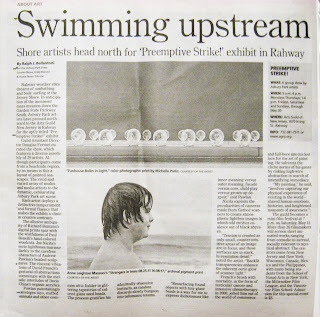 As you can see above, the article is called "Swimming upstream", by Ralph J Bellantoni. He's covered me in other reviews. Maybe he remembers my work from previous shows. 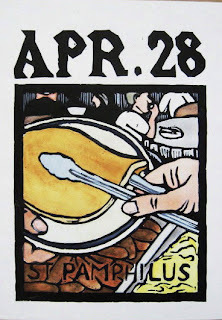 Not a whole lot about me- just a line about how one artist's digital prints "spar with the wistfulness of Paul Bonelli's hand colored woodcuts." Worse things have been written about my work in the press. I had no luck finding it on the APP website, but a further search turned it up on the website of a Morristown area newspaper, published 3 days ago. 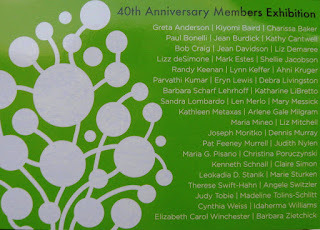 A bit of news that I did know about a few days ago but didn't get a chance to post here, is that two of my entries were accepted at the upcoming 40th Annual Members exhibition at PCNJ. The ones that will be going to the show are two pieces that were done for specific shows in Belmar last year- my house shaped print and the Animal Spirits print. With school about to end, I'll have plenty of time to get them ready and up to the gallery. We postponed our critique from the usual first Thursday slot it's had this semester to avoid a conflict with the show Molly and I have up in Rahway right now, but a few days ago I learned about another big problem. Seems that our new date would put us in competition with a grade school talent show being held in our building's theater. I offered options to the regulars, but the word came back to stick with Thursday, so that was the plan. Today was also my last Thursday afternoon class of the semester. Generally by the time I finish class, put away all the props, clean up the room, carry everything to my car, and get on my way, I tend to get up to the Studio just minutes before our 7 pm start time. No drawing today, just critiquing and grading, so even though I finished only minutes before the usual ending time, I was able to get straight to the car and take off for Ocean Grove. I came up Main through Bradley Beach about ten past six, and as I approached the building I could see cars were already filling the first row of our back lot. 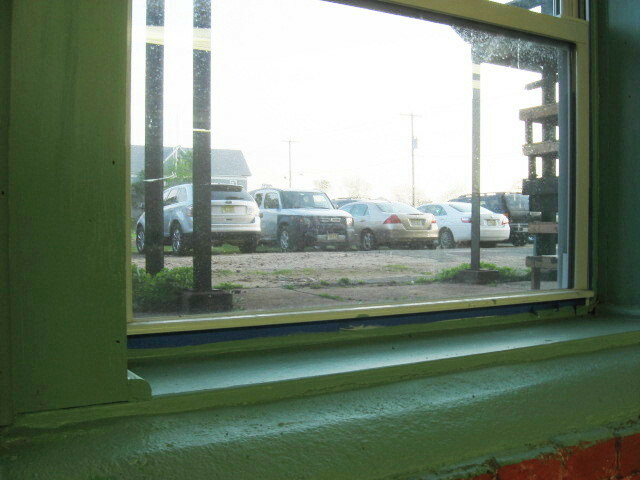 I gave the main parking lot a quick glance as I came around the building and grabbed one of the last few slots in the first back row, which you can see through our Studio windows. There would eventually be three rows of cars back there. I had enough time to kill that I went across the street to grab a slice of pizza before any of our people arrived. I was happy to see that several did arrive, making walks of various lengths from where they finally found parking. Once people made it down to the Studio the show had no impact on us. We had six bring art and a few others just come to enjoy the evening. 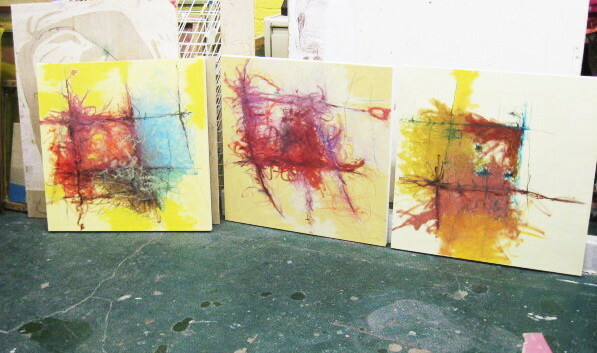 We opened with some smaller works. 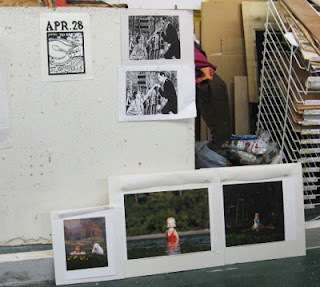 The board above has woodcuts from me and Mary, and three new photo collages from Jill. Next up was Vince, with three new paintings. His familiar grids are starting to unravel (visually), but with exciting results. 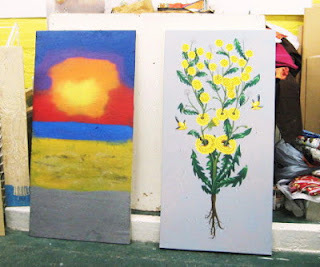 Below two more larger pieces- a colorful (spray) painting on wood from TJ based on a boardwalk sunset, and a canvas from Katie, featuring an oddly beautiful mutant dandelion. Regulars Tim and Harriet were in attendance, but didn't show anything. My piece got a fairly good reception. I gave a basic introduction to the story and explained the image, including my concern about the heavy chunk of black in the upper left. There was an opinion that I might be able to balance the area with color choices, which was going to by my first plan anyway. Everyone agreed that color choices in generally will decide how successful the image is in the end, and quite a few found themselves craving pancakes. After a computer related meeting in Belmar, I drove up to the Studio to proof my new block. The process itself went smooth enough, resulting in the above print. It's pretty much what I expected, except the upper left corner of the image really stands out as much darker than everything else. 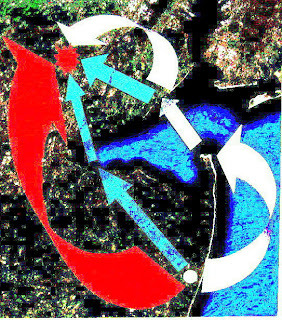 Before printing it I assumed that I could balance everything with the use of color, but I may have to go back in and recut some of that. So I just pulled the one proof for now, in case I decide to change it. Either way, I have something ready to show at tomorrow night's critique. Got the news this morning that both my entries for the latest Art on the Edge show were accepted by the jurying committee. Later I was at the Boatworks for a meeting and saw them both hanging on the wall in what I assume will be their official places, one in the front room, and the other right by the office door. 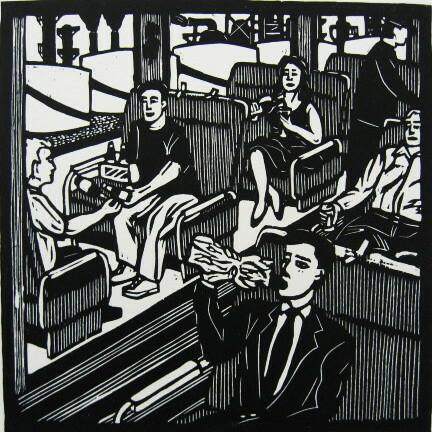 That means I have a good reason to to go to the opening reception, this coming Saturday, May 11, 2013, from 5 to 7 pm. The evening includes a live performance from Dr Void and the Death Machines, who also played at the first Art on the Edge show two years ago and were much better received than last year's live entertainment, which actually forced everyone in attendance to leave the building for the duration of their set. If you can't make it that night, the show will remain up through June 14th. Off from work today, but I had to wait for some work being done in my apartment to finish before I set out for the Studio. Found the parking lot spaces all full, but I grabbed a slot in the middle. Before I left the back lot outside my window was also full. (later I found out it was rehearsal for a talent show coming up in a few days) In about 90 minutes I finished cutting out the lower section around the saint name (scrambled eggs and sausages), then the upper section (people sitting around tables). 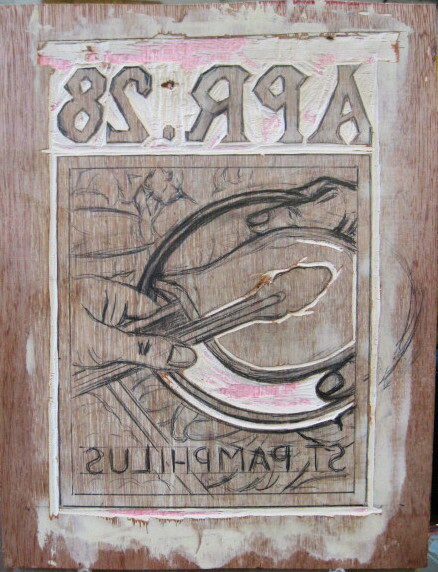 Stuck around a few extra minutes to widen the area around the date and border. Ready to print I think, but I'm going to save that until tomorrow. There was a big kids dance recital scheduled for the theater at the Jersey Shore Arts Center today. Usually I stay away when I know one of these big productions is going on, but I'd like to get this cut before the critique this coming week. I was able to get into the Studio and put in a bit more than an hour of work before I heard them getting ready to start the show. (the theater and stage is pretty much right above our space, and it gets very noisy when they've got a show going on) I finished both the pancake and the plate, then went on to finish the hands, the tongs, and a little piece of the steam trays below. What I have left is the rough background figures and the rest of the steam trays, as well as cutting the margin around the image a bit wider. I'll try to finish it Tuesday probably. Maybe I can even have time to pull a first proof. I had taken the current block home with me after my last Studio visit, so I could spend time looking at it and figure out what it needed. I took it back to the Studio this afternoon to address some of those issues. I had concluded that the perspective wasn't working on my redrawn plate, that is, the part on the far side (above) the pancake. It had become rounder, but that made it feel tilted up. So today I lowered the far edge about 3/8" and smoothed out the curve to match. I think the perspective works much better now. And after considering a few more positions, I eliminated the other hand holding the plate. It wasn't a lack of ability to draw an accurate hand, but that I realized that the plate was kind of small, only a little larger than the pancake about to be dropped on it. No need to use two hands to hold a plate this size, and they'd have to be so close together it would be kind of an awkward way to hold a plate. I liked the new version of the drawing, but decided to sleep on it before doing anything else with that upper part of the image. However, while there I did a little more cutting- reshaping the end of the tongs and cutting away a bit more of the top side of the pancake. I'm hoping to get back in tomorrow for a few hours and knock out some of the other major pieces of the image area. The Belmar Arts Council is continuing what has become an annual tradition, their Art on the Edge show, an exhibition devoted to LowBrow, Graffiti, Pop Surrealism, Surf, Skate, and Street Art. Basically stuff that tends to appeal to people far younger than the average BAC member. In fact, just reading the postcard is almost impossible for anyone over the age of forty. Edginess is in the eye of the beholder, and what I do isn't close to most of those above listed categories, but the subjects of my prints can sometimes be a little far out compared to the typical Belmar artworks. 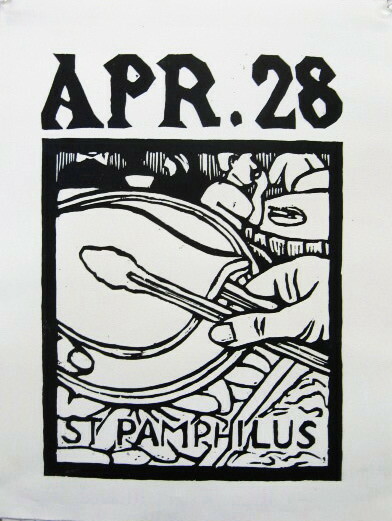 And all the Outlaw Printmakers dabble a bit in low brow art. In fact, the above piece has an Outlaw connection, a piece done for a group folio, and shown in an Outlaw show Tom arranged at the Contemporary Art Museum in St Louis. With the number of pieces I've shown at the Boatworks now risen past 400, I'm running out of new things to put in shows there, and many of the kinds of prints that would seem to fit with this kind of show have already been shown. The art style of this one isn't particularly edgy, but the subject should work. For a second entry I went way back, a hand colored piece that dates back to the 90's, one that I think I did down at an artist colony in Virginia. So old that I don't have a digital image of it available at the moment, but I ll take a picture of it if it gets into the show. 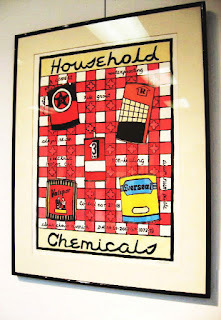 It borrows an overall design from a dish towel with a plaid pattern, decorated with images of pizza slices and names of toppings, which I replaced with vintage containers of household chemicals (part of a collection of such things left behind by my grandfather) and words taken from those labels. That may be weird enough to appeal to the people jurying this show. I'll find out the results of that on Wednesday. I was able to set aside some time for the Studio today, and brought the current St Pamphilus block and my tools (used for Sunday's demo) with me. 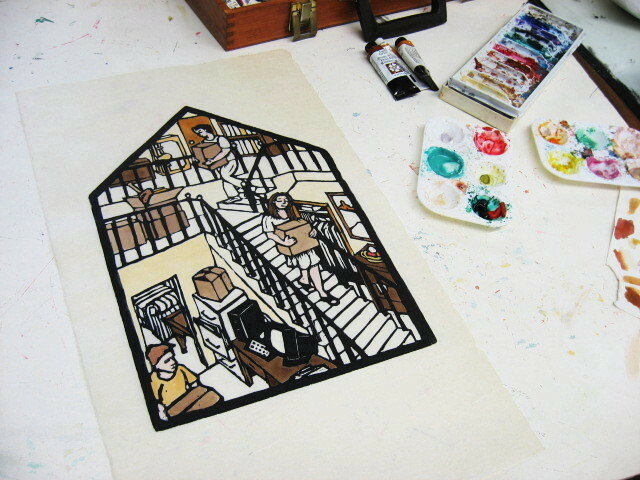 However, before doing any cutting, I wanted to fix a few things with the drawing. Even before Sunday's cutting, I had realized that there was an issue with the perspective of the plate being held out to receive a pancake. I had drawn the pancake and tongs first, then added the plate under it, but only showing plate on the viewer's side of the pancake (underneath it on the block), but later I realized that we should be seeing a bit of the plate on the other side (above it on the block) of the pancake. 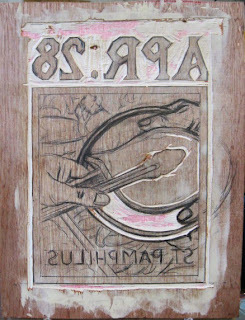 So before cutting on Sunday I briefly sketched in a plate edge, but avoided doing any cutting in that area of the block that first day. I assumed it would take a few minutes to correct the far edge of the plate, plus I thought I'd add another hand holding the plate. Almost two hours later I had the above drawing done, but still wasn't satisfied and not ready to continue cutting. The plate and hand were drawn from life (me) and are correct in themselves, but when you look at the whole thing they just don't fit with the originally drawn piece. I can't change the earlier drawing, already cut into the block, so I'll need to go back into what I had worked on today. My goal is to have this thing cut before the next critique, a week from tomorrow, and I'm still on target for that.